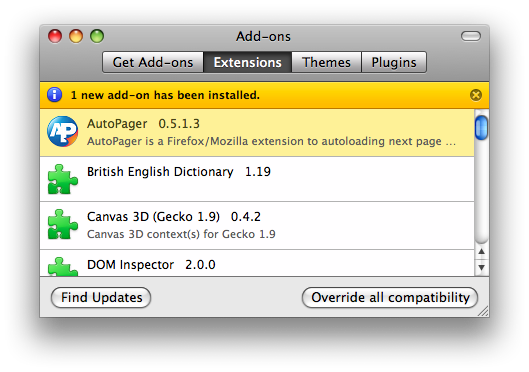 I’ve just landed code that allows extensions to include their icon in the add-ons manager view even when disabled. Currently extensions provide their icon by giving a chrome iconURL for us to load. This can only work when the extension is enabled since we don’t register the chrome otherwise. Themes on the other hand provide their icon as a simple file called “icon.png” alongside the install.rdf. Well extensions can do this too now and it will be used in preference to the iconURL but more importantly works at all times (well not before installation yet, but that is at least feasible this way). We’ll continue to support iconURL for a time to come I imagine, but if you want to keep your icon when users disable you then just put your icon.png alongside the install.rdf (keep the iconURL if you want to work in Firefox 3.5 and lower of course). This is only in trunk builds right now (today’s Linux nightly has it, tomorrow’s OSX and Windows nightlies will have it). 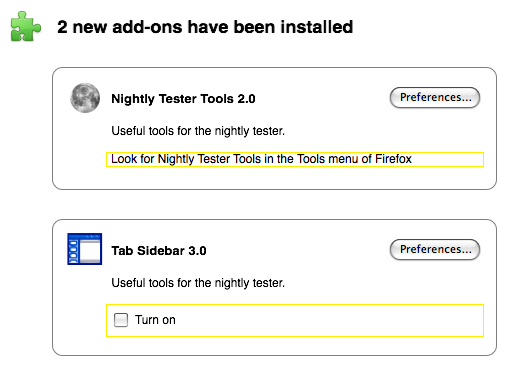 It will be making its way to the Firefox 3.6 nightlies soonish.